I’d just completed my freshman year in college and was home for the summer. Dad lined up a job for me through one of his buddies in the personnel department of Fairbanks-Morse where I’d be working in a factory that manufactured diesel engines for ships and trains. Perhaps he thought working in a sweaty, loud environment would encourage me to stay in school. I guess he hadn’t visited my dorm recently. When the whistle blew at 3:00 pm, ending my shift, I’d sometimes meet up with Carl and we’d hang out, listen to music, practice our guitars, harmonize and wax philosophical. Carl and I hadn’t played music together for a couple years following his departure from the now long-defunct No Left Turns. But this summer we entertained ourselves and a few close friends by plunking out some tunes we learned. It was mostly stuff by the Beatles, Dylan, Donovan, Judy Collins and a few others. We worked out a pretty good arrangement for the song Two Of Us by the Beatles. At least one of us was a folksinger wannabe. You can probably guess who. 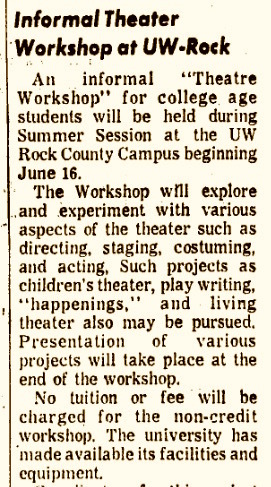 While I was busy in the sweatshop, Carl was enrolled in a summer theater workshop at the University of Wisconsin Center-Rock County, sponsored by their drama department. Often, I’d accompany him to workshop sessions where our creative juices mingled with those of like-minded music and theater junkies. That talented group would work on play writing and hash out ideas for producing and staging a show. 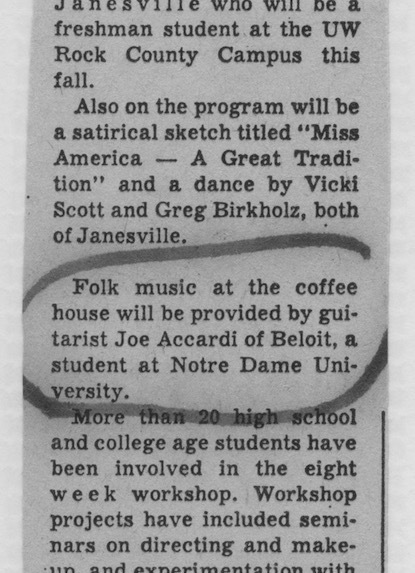 A public performance was planned for the finale, designed as a coffeehouse program to include original sketches, interpretive dance and folk music. 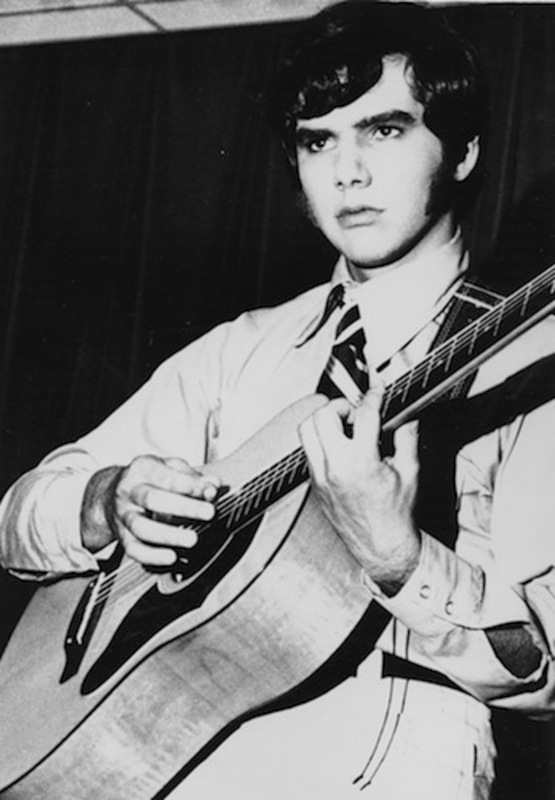 I was drafted, without resistance, to be the evening’s folksinger, having honed my chops the previous fall in a basement coffeehouse at Saint Mary’s College across the road from Notre Dame where I’d be headed back to school and my girlfriend in a couple weeks. “Rock River Revival: An Evening of Coffee House Entertainment” was presented on a balmy Sunday night in the all-purpose room at UW-Rock County. Acting and dancing our way through the evening, I hammed it up in the role of “Ferd Barks, Master of Ceremonies” for an original satire, Miss America – A Great Tradition. Additionally, an interpretive dance was choreographed to lampoon the old Carrie Jacobs Bond parlor song, A Perfect Day. Bond was a Janesville, Wisconsin native perhaps most noted for her song, I Love You Truly. The dance sequence involved “living statues,” one of whom was me. It was my first arabesque. The final slot of the evening was the much anticipated (by me, anyway) folk singing during which I stood solo with my guitar on the proscenium stage in front of a drawn velvet curtain, nearly blinded in the bright spotlight. It was my Bob Dylan moment to be sure. I even recall playing a couple of Dylan songs, You Ain’t Goin’ Nowhere and It’s All Over Now, Baby Blue,” in addition to several by other popular folksingers of the day. The problem with standing in a spotlight is that it’s sometimes difficult to judge the passing of time or gauge audience yawn-frequency. You’re sort of drifting in space, especially when you don’t have a written set list and you become oblivious to how far beyond the allotted fifteen minutes you’ve gone just singing whatever songs pop into your head. It must have been disappointing for the stage manager to be without a shepherd’s hook at that precise moment. So he did the next best thing. He sent Carl out to physically lift me up and carry me offstage, much to the delight of the exhausted audience. I never really figured out whether they were applauding my performance or Carl’s. Either way, I remain fairly certain they thought it was part of the show.